Recently, we sighted this striking plant with captivating variegated foliage at a residential bungalow in the neighbourhood and rekindled our yearning for it again. Anyway, we were unsure whether this lovely tree can be added to our small garden paradise due to space constrain. There’s limited area for it to be planted in the ground. It took us sometime to realize that it can be alternatively grown in a large pot. Hopefully soon, our yearning days for this beauty are over and we’ll be able to purchase it when the garden nursery in our vicinity has it for sale. Most likely we may need to source for it elsewhere if unavailable nearby. 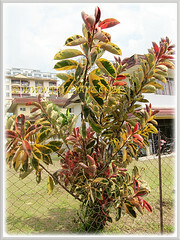 Common Name: Variegated Indian Rubber Tree/Fig, Variegated Rubber Fig/Tree, Variegated Rubber Plant/Bush. Etymology: The genus, Ficus is from the Latin word, ficus, meaning fig and fig tree. Origin: Native to northeast India, Nepal, Bhutan, Burma, Yunnan in China, Malaysia and Indonesia. 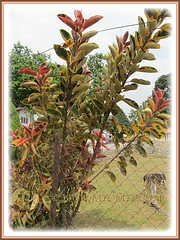 Plant type: An evergreen tropical and tender perennial tree. Features: Ficus elastica is a species of plant in the genus Ficus that comprises of about 850 species of woody trees, shrubs, vines, epiphytes and hemiepiphytes. 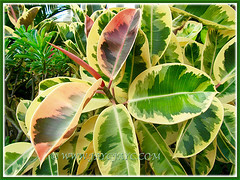 On the other hand, ‘Variegata’ is a captivating cultivar of Ficus elastica. 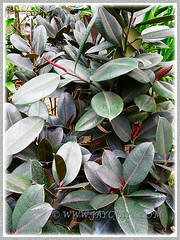 Ficus elastica is a fast-growing tree and can reach 30-40 m in its native habitat. Generally though, cultivated varieties that are grown in gardens, potted indoors or outdoors in the ground, usually have much more manageable height and reach more or less to 3 m tall. Rubber tree or Rubber bush is thus commonly named because of the rubber sap that oozes out of the leaves and woody stems when scratched or cut. There are several variegated cultivars of Ficus elastica but ‘Variegata’ is our favourite. 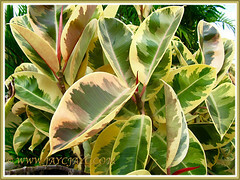 It is moderately fast-growing and produces thick, bright and glossy variegated leaves. A variety of colourful hues enhance its foliage, which include creamy yellow margins, an ivory-coloured or sometimes reddish midrib and various shades of green, grey, pink and red. An added bonus are the red sheathes covering the unopened leaves at terminal stems, providing a lovely contrast. Absolutely striking indeed! Leaves can be 20-30 cm long and 10-15 cm wide, oval to elliptic in shape. Simple leaves with entire leaf margin and are arranged alternately along the stems. Cultivars of Ficus elastica are not known to produce flowers and figs. 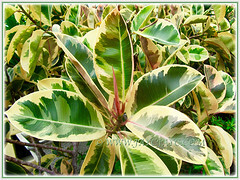 Culture (Care): Ficus elastica ‘Variegata’ grows easily with minimum care. Under ideal growing conditions, it will live for many years in your home or outdoors in the garden. Light: Full sun, partial sun or semi-shade. Moisture: Moderate water requirement. Allow the surface soil to dry out between waterings, especially if plant is potted. It benefits in humid conditions. Soil: Any well-draining and well-aerated potting soils will be fine. Others: For indoor potted plants to look healthy and at their best, sponge the leaves occasionally to clean and remove accumulated dust. Overwatering your plant will result in leaf loss. Avoid sudden temperature drops or cold drafts that can cause leaf drop or yellowing. Do not relocate the pot too frequently to avoid stressing it. Feed with diluted liquid fertiliser once monthly. 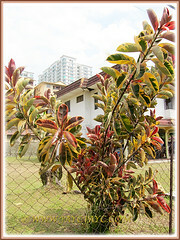 Prune your plant according to your preference, either as a standard specimen or a bushy plant in their formative years. Generally free from serious pests and diseases but mealy bugs and scale can be a problem occasionally. For subtropical and temperate regions: Hardiness: USDA Zone 10b – 11. 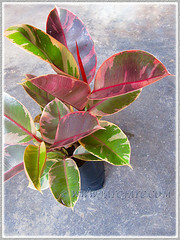 For non-hardy regions, best to grow as houseplants indoors or in a greenhouse. Provide sufficient sunlight to keep the foliage colours vibrant. Avoid drops of temperature or cold drafts from air conditioners that can cause leaf drop or yellowing. During winter, reduce watering, keeping the soil just moist and avoid feeding. Feed during spring and summer with a balanced fertilizer. Propagation: By stem cuttings or air layering. 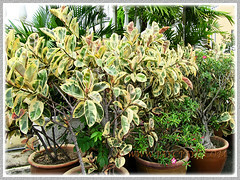 Usage: Ficus elastica ‘Variegata’ or Variegated Rubber Plant is popularly grown as a potted house plant. Grow Rubber Plant for cleansing the air indoors. Great specimen trees for landscaping. Ideal to be planted as ornamental roadside trees or along highway median to beautify the landscape. Excellent for container planting and located at patio, porch and courtyard. Also, plant them as screen for privacy. Dr. Wolverton has recommended that one of the best houseplants to purify the air indoors is the Rubber Plant. Thus, why not include this beauty in your home? 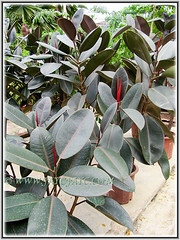 Sharing images of the cultivars, Ficus elastica ‘Black Prince’ and ‘Burgundy’. They have dark green to blackish grey-green coloured leaves with a red midrib. The reddish leaf sheathes covering the unopened leaves provide a beautiful contrast with the dark foliage, don’t you think so? Yay, our hunting days for Ficus elastica ‘Variegata’ are over! Managed to add a very young plant that cost us only RM23 to our garden 3 days ago. We’re over the moon, so to speak! 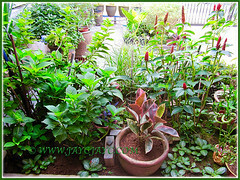 Presenting images above to give you a peep at our beauty that was transplanted into a pot, that’s half buried into our garden bed. Hope it’s happy there and will grow steadily to give shade to the Hydrangea plants on its left. I was reading your article about the Ficus Variegata, and I have been doing research about the lost of shine in their leaves as well as why the colors change in their leaves? I got a cream and purple one and it has slowly been loosing its colors as well as the shine. And in fact the new leaves come out with spots, an uneven color. And I was wondering if you guys have more information about this kind of problems.